When, more than half a century ago, the ingenuity of the Yankee gun maker devised a machine that could be substituted for hand labour in the manufacture of the irregularly-shaped parts entering into the mechanism of firearms, the first step toward the successful duplication of gun parts was accomplished. The subsequent, rapid perfection of these early machines, and the successful production of properly formed cutting tools for their equipment marked the final step. Then came that bitter struggle for the preservation of the Union; and, while New England homes were furnishing men, New England armouries were furnishing guns, guns made by the newly-perfected process of milling to exact form and gauge, which alone made possible the production of the many hundreds of thousands of small arms that were supplied to the Union armies by the government and private armouries. 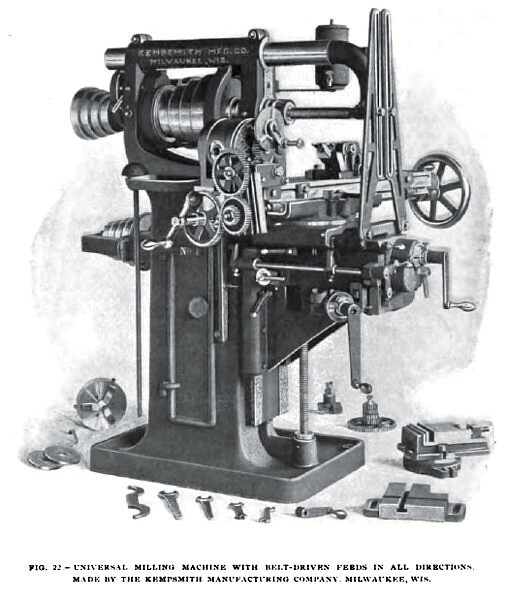 After the Civil War, the manufacture of sewing machines for household use became an extensive industry, which required the same methods of manufacture as the making of firearms, and through it the process of milling was rapidly advanced and gradually adapted to the general manufacture of machine parts. 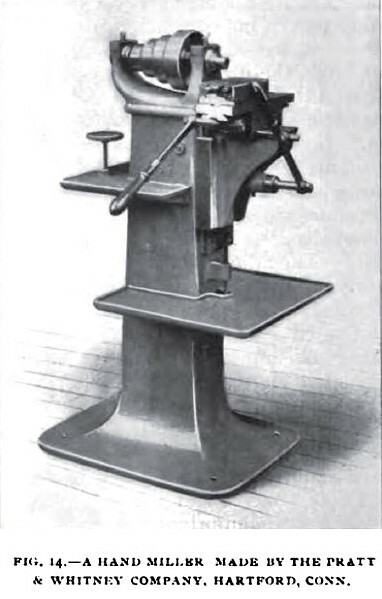 There are records of a primitive hand milling machine that was used in Connecticut at the beginning of the nineteenth century, and of milling machines with power feed that were used in armouries in the forties. 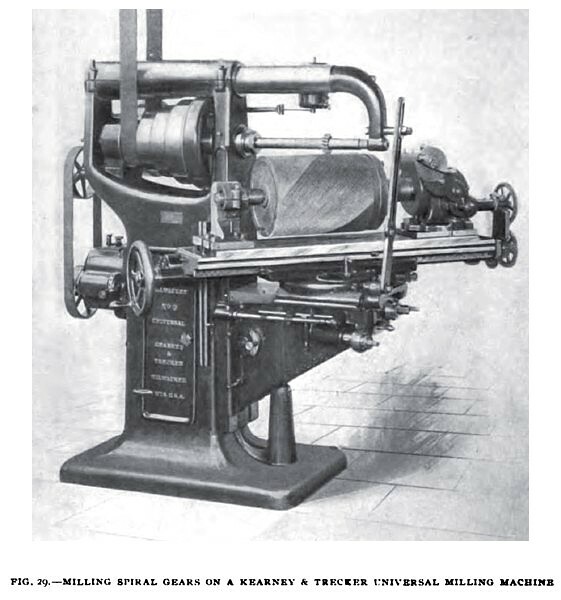 Important improvements were made on the latter about 1850, by one C. McFarland, but his machine still retained the rack and pinion feed arrangement, and was replaced four years later by the Lincoln miller, which “embodied the invention of a screw feed with quick-return hand motion." 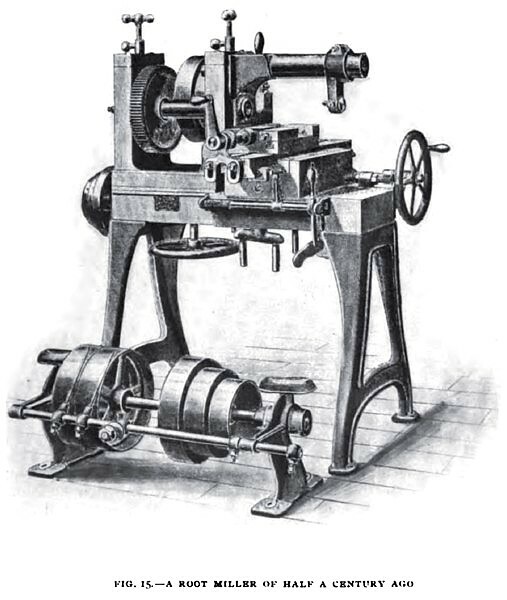 The original designs of this machine were made by the late Francis A. Pratt, while superintendent of the Lincoln Foundry and Machine Co.; hence, the name "Lincoln Miller." The rack feed machines did not have an even table motion and were used only for roughing-off the pieces to be afterwards filed to size and finish. All this was changed by the even motion of the screw feed Lincoln miller, on which, when equipped with "gangs" of cutters, the then exceedingly difficult feat of milling irregularly shaped gun parts to gauge was first successfully accomplished by one Gilbert A. Bush, who also made his own cutters, which gained for him quite an extensive reputation as a tool maker. 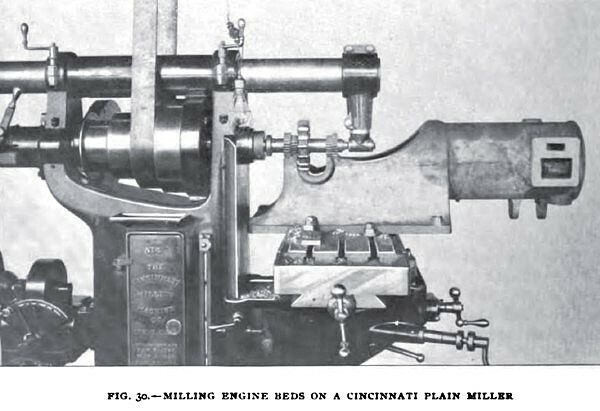 Such is the early history of the Lincoln miller, which is also the early history of the duplication of gun parts on the milling machine. This type of machine is largely used today in the manufacture of firearm, sewing machine, and typewriter parts, and work of a like character where large quantities of similar parts are to be milled. Usually a machine is set up to perform a single operation, the work being passed through as many machines as there are operations to be performed. The method of making adjustments on these machines is somewhat tedious, and their field of usefulness is therefore confined entirely to the duplication of small parts. Fig. 1 shows the present style of the Pratt & Whitney Lincoln miller, the general design of which differs but little from the original machine. The fact that this company alone has made over 7000 of these machines gives one an idea of their extensive use. A recently designed tool of this well-known type has just been brought out by the Hendey Machine Company, and is shown in Fig. 2. It has a six-speed feed changing device, driven by a two-step cone, giving 12 changes in feed, ranging from 0.006" to 0.065" Per revolution of cutter. The machine is equipped with an oil pump and provided with a large pan, which drains into the reservoir beneath. Fig. 3 shows a miller, made by The Grant Tool Company, which is especially interesting in the method of making the vertical adjustment. This is accomplished by means of a handle shown in front of the head of the machine, through the medium of a worm and worm wheel, enabling the operator to make the finest vertical adjustment of the spindle. This feature makes the machine adaptable to a large variety of work. Figs. 4, 5, and 6 illustrate examples of what is commonly known as the planer type miller. These machines are now quite common in railroad, locomotive, steam pump, and electrical, as well as machine tool shops where they are performing the operations that were formerly done on heavy planers, on widely varying kinds, shapes and sizes of machine parts. The machine shown in Fig. 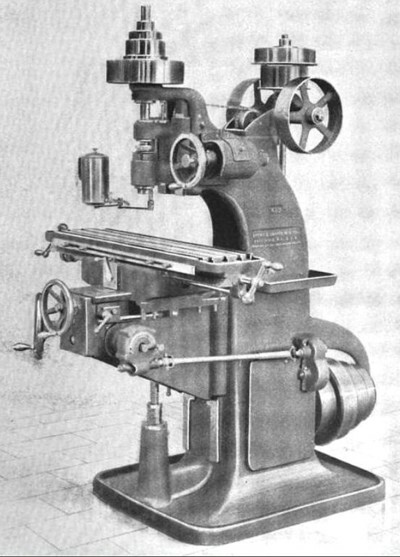 4 illustrates one size of tour-head milling machine, made by the Ingersoll Milling Machine Company, and an idea of the size of the largest of these machines can be gained from the following figures which apply to the 81-inch miller. The table is 73 inches wide by 15 feet long. It will take in work 82 inches wide and is 40 inches high from the top of the table to vertical spindles. The total right-hand vertical spindle has an automatic reversible feed across the machine. By reason of this combination of four spindles, both horizontal and vertical, together with a wide range of adjustments, this style of machine is particularly well adapted to a great variety of work. The machine just described is shown in operation in Fig. 26. 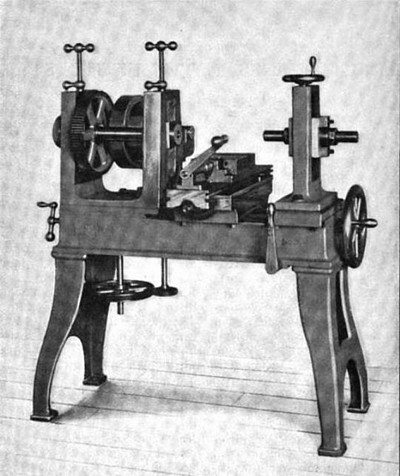 A miller of the same type, but having only the two vertical spindles, made by the Niles Tool Works Company, is shown in Fig. 5. This machine is well adapted to profiling, the spindles having a 6-inch vertical adjustment, with power cross feed, and each saddle carries a weight of the machine is approximately 15 tons. The table has the Sellers drive and has a feed range of from 3-16 inch to 10 inches per minute. All four heads can be driven at once; the horizontal heads can be driven independently of the vertical, and vice versa, and the former or copying attachment. The table is 20 inches wide and is driven by a spiral pinion and rack, insuring the steady movement which is so essential to successful milling. Another machine made by the same company is shown in Fig. 6. This is a good example of the class of machines which are commonly known as " slab millers." It is now generally conceded that the limiting factor of milling operations is determined by the strength and durability of the cutter. These are greatly extended by having a thoroughly rigid frame and a powerful driving train for the feed of the machine. There is no class of milling that meets with failure so often as the apparently simple operation of slabbing. The immense stress imposed on the machine by the great width of cut that it is expected to take, invariably causes chattering to an alarming degree, —the great bug-bear of milling to the inexperienced operator. The only solution of the problem lies in the proper selection of cutters, the use of a fast feed, and a machine of ample proportions to stand the strain. The liberal proportions of the machine illustrated in Fig. 6 show careful consideration of all these factors on the part of the designer. 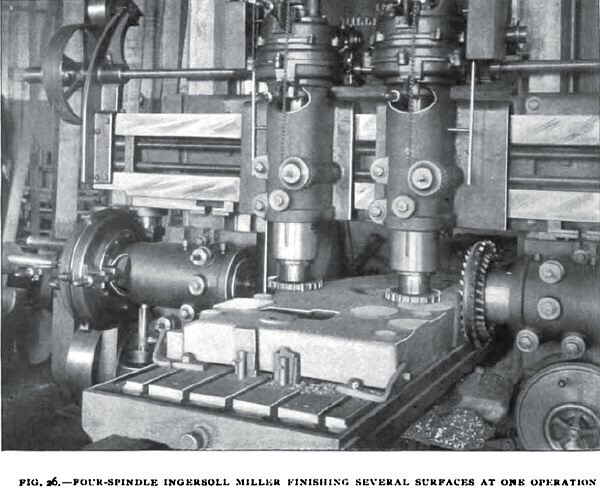 It may be interesting to note in passing, that the Ingersoll Milling Machine Company makes a slab miller, which, while it still retains the general form of a planer, does not have a cross rail nor a top rail, the spindle housings being mounted directly upon the uprights, the upright carrying the outer end of the arbour being removable, making the machine "open-side," which is of decided advantage for face milling pieces of large size. The machine shown in Fig. 7 is made by the Pratt & Whitney Co., and marks a step in advance in the evolution of the planer type miller. Here the cross rail and top rail are absent; the housings have developed into wide faced, substantial columns, secured to a large base, the entire framework being sufficiently rigid not to need the top tie bar. The feeding and elevating mechanisms are placed at the front of the base; operating and adjusting levers are within easy reach of the operator, which greatly adds to the convenience of handling. The heads may be operated and adjusted simultaneously or independently, to suit conditions, and the uprights can be adjusted to and from the table. 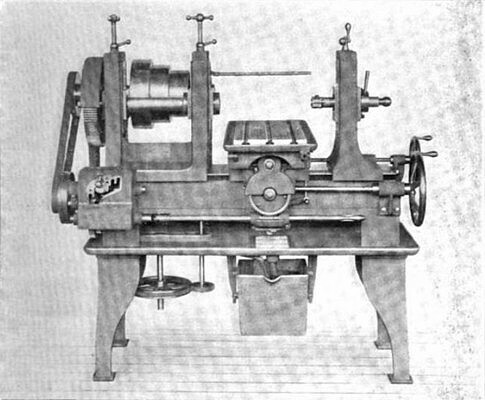 A double horizontal spindle, or duplex miller made by Beaman & Smith Company, is shown in Fig. 10. Both spindles are driven at the same speed, by one belt, with ten variations in speed, ranging from 9 to 32 revolutions per minute. The spindle heads are adjustable, horizontally, to and from the table and can be set to a minimum distance of 4 inches and a maximum distance of 48 inches between the ends of the spindles. The table has a longitudinal screw feed of 48 inches, is carried by a vertically adjustable knee providing 11 inches vertical adjustment, and the rate of feed can be varied from 1 to 6 inches per minute. An excellent example of the modern “column” type of vertical spindle miller is shown in Fig. 8, a machine built by the Brown & Sharpe Manufacturing Co. This type of miller may be considered broadly as a heavy form of profiling machine and finds its best application in profiling operations, using face or end milling cutters. 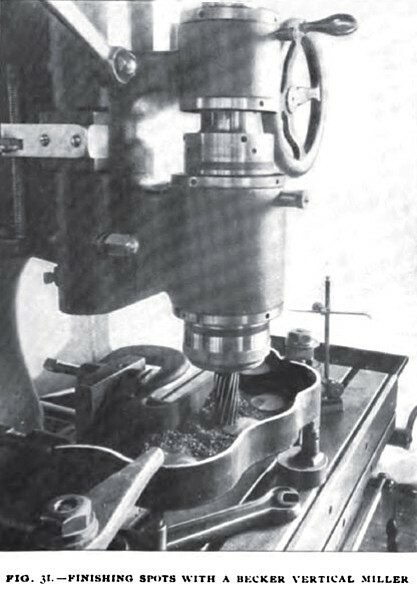 The use of surface mills, which on this machine are used for finishing the edges of the piece, is very limited because of the difficulty of supporting the outer end of the cutter arbour, and consequently such operations are almost entirely confined to surfaces that can be covered by the axial flutes of end-milling cutters. It is generally conceded that face milling is the more economical method of finishing surfaces, as compared with slabbing, and it is here that the vertical spindle miller has the advantage over the horizontal spindle machine, particularly in the manner of chucking the work. Let us consider the operation shown in Fig. 27. To accomplish this with a face mill on a horizontal spindle miller involves the use of the knee-plate fastened to the table of the machine, to secure a surface parallel with the face of the mill, for holding the work. That this is awkward is evident, and if the knee plate springs, as it is almost sure to do, it is impossible to get a true surface. To do the same job on a vertical spindle miller, the piece is simply clamped to the table of the machine, in doing which the operator is aided by gravity, and unless the machine itself should spring, there is no difficulty in getting a nicely finished, true surface. When millers of this type are equipped with a rotary table, as shown in Fig. 9, they are well adapted to finishing curved surfaces that end abruptly or merge into straight lines, and are especially valuable for finishing the periphery of circular pieces having irregular surfaces, as, for example, steam engine eccentrics. It is evident that by using a cutter of the proper form to give the outline desired, such pieces can be made exact duplicates of one another, and if the eccentric straps are finished in the same manner, with a cutter of the proper form, work can be produced that will be entirely interchangeable,— a result not so easily obtained on the lathe. The Brown & Sharpe machine shown in Fig. 8, is especially interesting in the method employed for increasing the number and range of spindle speeds, and the feed-changing mechanisms. The spindle can be driven at twelve different speeds, six of which are obtained through the usual medium of double countershaft pulleys in connection with the three-stepped cone pulley on the back of the machine, from which the speeds are transmitted to the spindle by the main driving belt which passes from the pulley on the cone shaft over the idlers at the top of the machine and drives the large pulley on the spindle. For each of these six speeds an additional faster speed is obtained through the use of two auxiliary belts, one of which runs on the large driving pulley, passing underneath the main driving belt which rides on it to the small step of the pulley on the vertical shaft at the rear of the machine, while the other runs from the large step of the pulley at the back of the machine and drives the]"small driving pulley. When the spindle is driven at these higher speeds by the auxiliary belts, the large driving pulley is disconnected and runs free. On the other hand, when the spindle is being driven at the slower speeds, the top auxiliary belt must, of course, be taken off. The vertical shaft serves to drive the feed mechanism which is almost entirely enclosed in the column of the machine. The feed changes are secured by a single lever movement, causing a sliding gear to be brought into mesh with the proper unit of the nest of gears of different diameters which forms the feed varying device. Motion is carried from this sliding gear to the table through spur gears and the usual universal joint shaft. Since the belt which drives the vertical shaft is of the same size as the main driving belt, being virtually the main driving belt when the higher speeds are used, it is evident that the feed of this machine is positive to the full extent of the meaning of that term as at present applied to machine tool feeds. Fig. 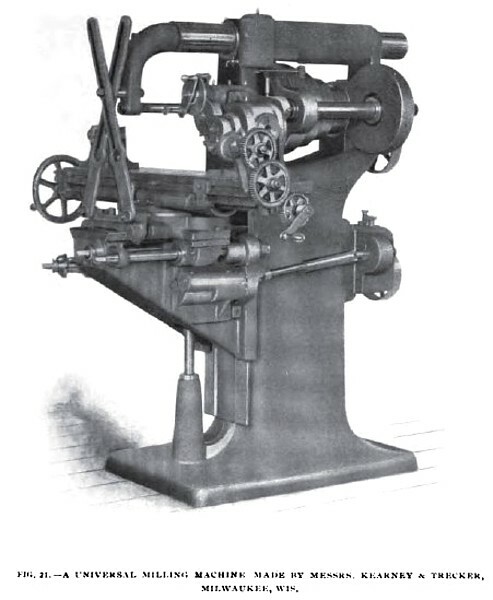 9 illustrates a machine of the same type, made by the Becker-Brainard Milling Machine Company. This is shown with rotary table in position on the platen of the machine. The automatic power feed of the rotary table does not interfere in any way with the regular feed of the main table, which makes possible the successful milling of irregular surfaces mentioned above. The machine is fed through the medium of cone pulleys and belt. The cut shows the machine direct connected to a motor, the armature of this occupying the same position as the cone pulley on the machine shown in Fig. 9. 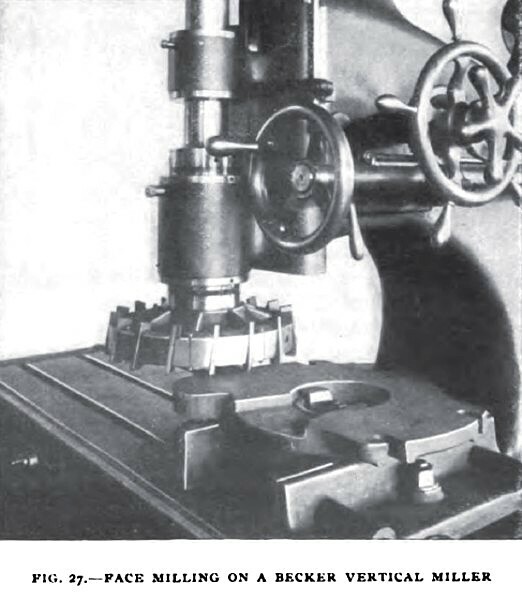 A heavy vertical-spindle miller having a bevel gear spindle drive, made by Messrs. Bement, Miles & Co., is shown in Fig. 11. The spindle has hand vertical adjustment, and is driven by a 4¼-inch belt on a four-step, 21-inch diameter cone, through the medium of bevel gears with a ratio of five to one. A circular work table, 32 inches in diameter, forms part of the machine, and it has power rotary, longitudinal, and transverse feeds, which can be varied infinitesimally while the machine is running, being driven by friction discs. Provision is made for the use of copying attachments. Although the present tendency is toward the use of the heavier milling tools, there has been no abandonment of the smaller machines. On the contrary, as milling operations become more clearly understood, the field also widens for the small millers. The machine shown in Fig. 12, which is made by the Whitney Manufacturing Company, is supplied with a weight attachment which provides automatic vertical and horizontal feeds. The table is also provided with hand screw feed, for making long cuts, which obviously gives a smoother motion than the lever feed through rack and pinion and reduces the liability of cutters " gouging" into the work. These machines are excellent for taking short, rapid cuts, as when slitting small copper and brass work for electrical fittings, forming certain cash register details and other similar work that does not require a particularly high finish and which is of such a form as to be difficult to hold in string jigs. The machine shown in Fig. 14 is made by the Pratt & Whitney Company, and the chief points of difference between it and the machine in Fig. 12 are made evident by a comparison of the illustrations. 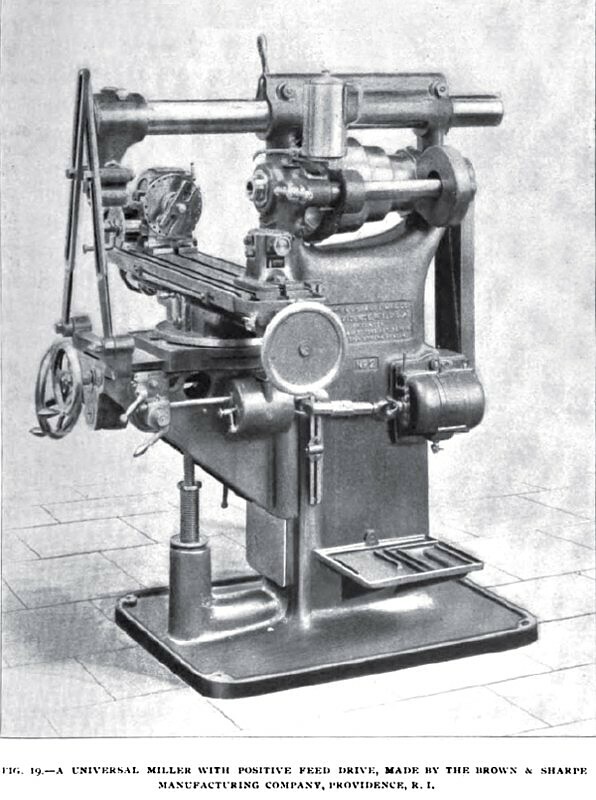 One of the oldest, and probably the best known, types of miller is the "column and knee" machine, which came into existence several years after the Lincoln miller first achieved success. The first departure from the conventional design of the Lincoln miller was made about 1854, when Mr. E. K. Root, who was then superintendent of the Colt Armory at Hartford, designed the miller illustrated in Fig. 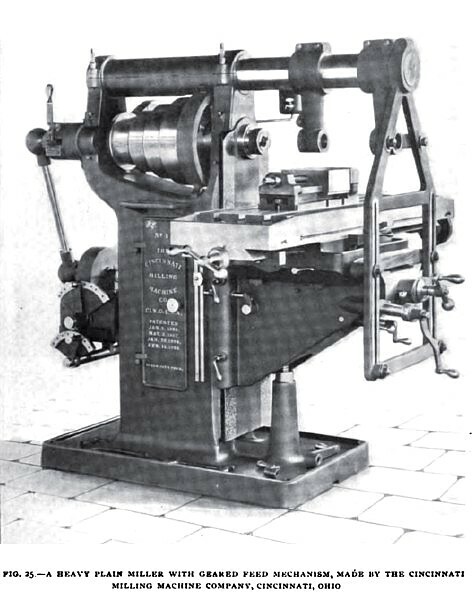 15, which embodied all the essential features of the Lincoln type, except that in this machine the outer end of the arbour is carried by a support from an overhanging arm secured to the head of the machine instead of the usual outer support resting on the bed. This construction possessed the great advantage of being what in a planer is called " open side." capable of performing operations on work that could not be passed between the head and foot stock of the Lincoln miller. From this machine it is but a step to the early Garvin plain miller shown in Fig. 13, which was designed several years later. 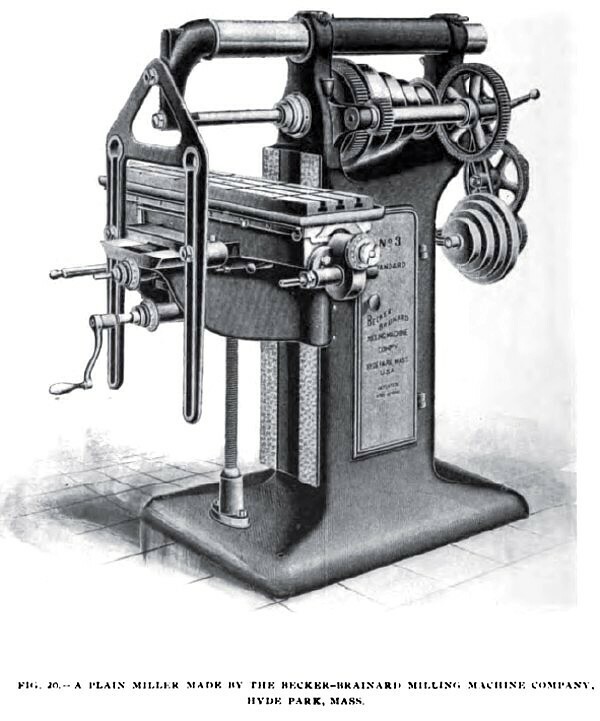 Contemporaneous with the latter was the invention of the " universal" milling machine by Mr. J. R Brown, who, about 1860, was confronted by the need of a machine that would produce spiral forms quickly and accurately in the manufacture of sewing machines. 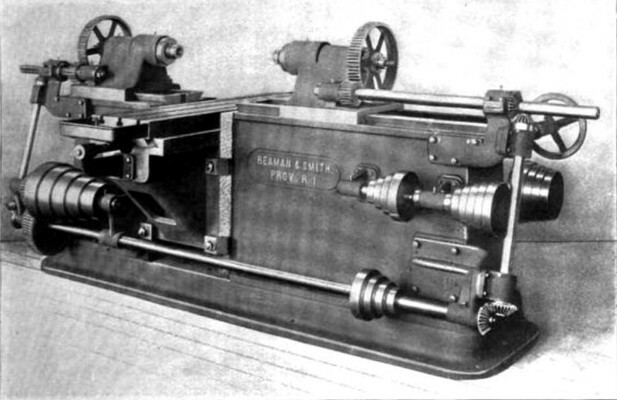 He constructed a milling machine having a swiveling table and equipped with an indexing and spiral-generating device. These machines were put on the market in 1862. 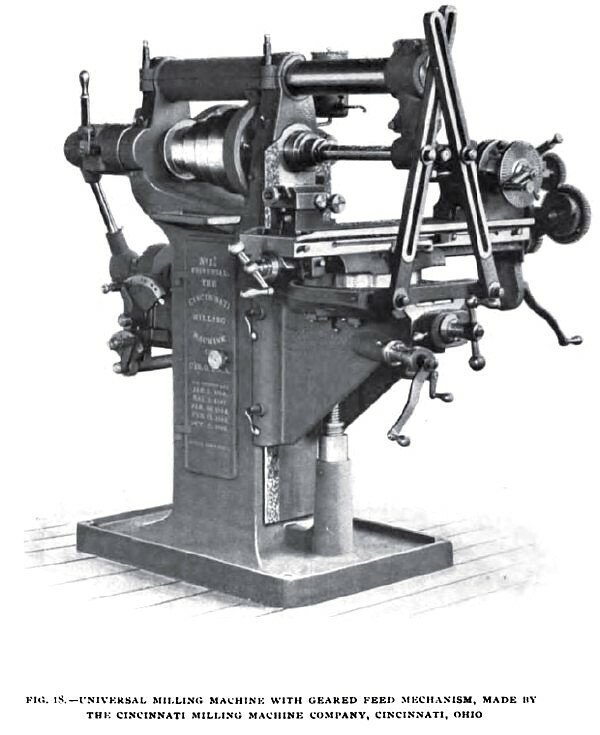 The first machine sold is illustrated in Fig. 16, and justly deserves the honour of being the first universal milling machine. The machine in Fig. 13 combines the " column and knee" of the Brown machine, Fig. 16, with the "overhanging arm" arbour support used by Root, and in it we find the prototype of the " column and knee" miller of the present day. 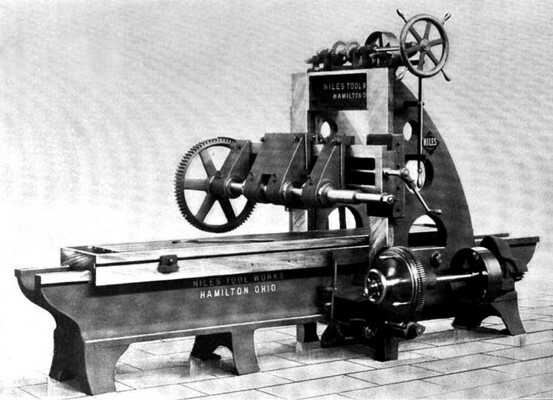 Improvements were made on these early machines from time to time, and about 1886 a machine was brought out by the Cincinnati Milling Machine Company which embodied many important improvements invented by Mr. Frederick Holz, the present president of the company. This machine is shown in Fig. 17. In the design of this machine especial attention was given to provision for accurate adjustment and convenience of manipulation. The adjusting levers were all provided with micrometer dials, which were first used on a miller by Mr. Holz about 1881, and the shaft for elevating was placed at an angle so that the elevating crank and the cross screw handle could be used simultaneously. These may seem like small and unimportant details, but it will be noticed that they have been almost universally adopted by the builders of this type of miller, and the perfecting of just such details has been the chief factor in the development of the miller and have gained for it the important place, which it occupies to day. Since that time rapid strides have been made in the advancement of milling processes, and radical changes in the design of the machines followed as a consequence. Just as the early machines were the direct outcome of the designers' needs for such a tool, so, we may safely say, the re designing that they have undergone from time to time has been the direct outcome of the needs of the builders and the needs of their customers. A comparison of the early machines of this type alone with the machines into which they have developed gives one an adequate idea of the growth of milling as a method of metal working. The early Brown miller was smaller than the smallest " universal" miller made today: it did not have a support for the outer end of the cutter arbour, and was intended only for very light work. It has developed into a series of universal millers, the largest of which has a table travel of 33½ inches and weighs approximately 4700 pounds. The Holz miller of sixteen years ago was about the same size as the smallest plain millers of to-day. 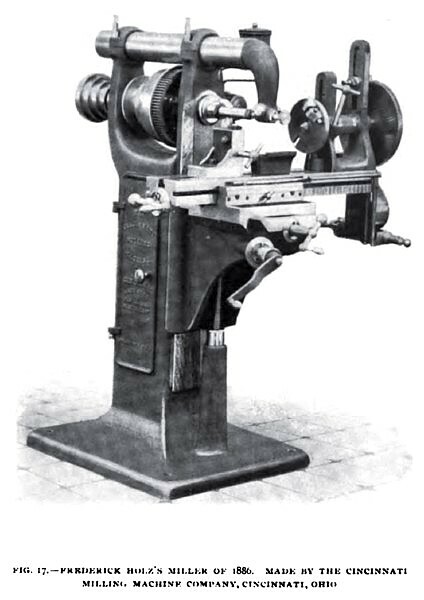 It had only six changes in speed for the spindle and only six changes in the rate of feed The range of these speeds and the maximum rate of feed seem to have been considered of very little importance in those days, as they were not mentioned in the catalogues nor in the descriptions of the machines which appeared in the trade journals of the time. 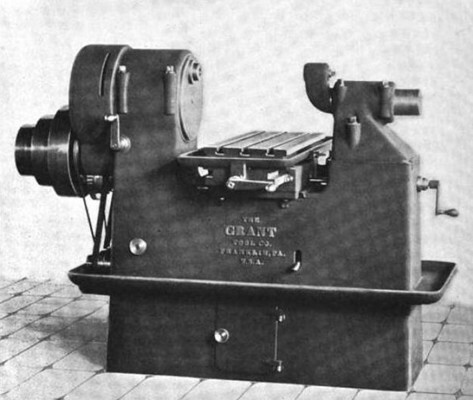 This machine developed into the plain miller shown in Fig. 25, which has a table feed of 42 inches, sixteen changes in spindle speeds and sixteen changes in rate of feed, ranging from 0.006 in to 0.300 inch. The complete machine weighs approximately 4800 pounds. The facility and accuracy with which these machines can be adjusted to the work, the ease with which they can be handled while in operation, and the large variety of attachments with which they can be equipped adapt them to a wide range of work and make them equally efficient for "jig" milling, face milling, key seating, profiling, rack cutting, cam cutting, and gear cutting, and, if universal, we can also include the automatic generation and forming of helices, an operation which is especially useful in tool making, and in cutting the spiral gears which are being largely used in automobile and gas engine construction. It is no wonder, then, that they have entirely replaced the Lincoln type millers, with the single exception of the armouries where a machine is set up and used for performing only one operation, in which case the simply-constructed Lincoln miller is to be preferred. But for general manufacturing purposes, whether pieces are made singly or in lots, the knee type miller is the most convenient and efficient tool that can be used. These machines can be set up in a very short space of time to suit any job that comes within the range of their table travel, and are equally efficient for taking a long cut on a single piece, milling a single piece at a time when the surface to be finished is short. The proper way to hold the work is, of course, by means of special fixtures. But this applies to the shaper, planer and drill press, as well as to the milling machine. The modern manufacturing machine shop has a complete and expensive a jig equipment in its drilling and planing departments as in its milling department, and the economy of such an equipment is well recognized. It is a rather common notion among shop men generally that work can be done economically on a miller only when the pieces are held in special fixtures. 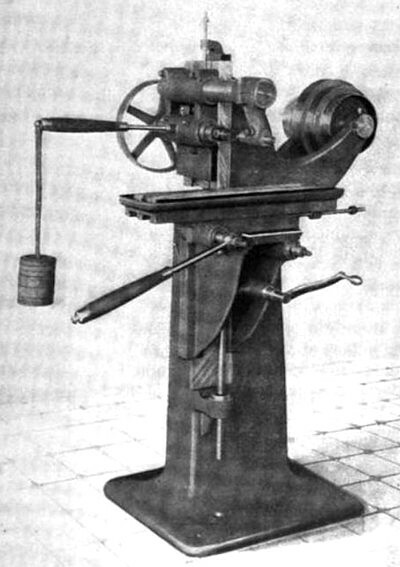 As a matter of fact, the table of a modern miller has a large working surface, and is provided with a liberal number of “T” slots, so that the work can be clamped as easily and as satisfactorily on it as on one of the older and better known tools. Fig. 30 shows a “column and knee” type miller performing the operation of milling a gas engine bed for the crankshaft bearing, and it will be noticed that in this case the work is clamped to the table of the miller with such common appliances as are used on the simplest tools. 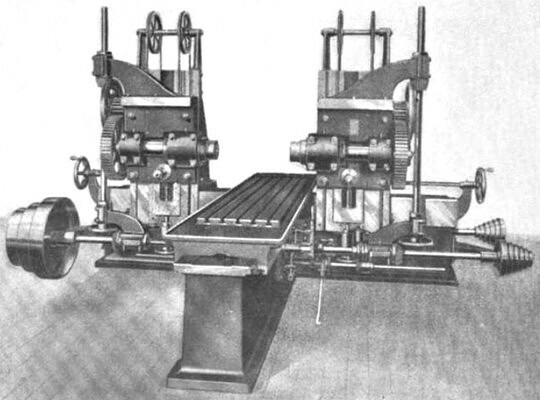 That these machines are being used for very heavy work,— that is, deep and coarse feeds, — is evidenced by the fact that the old method of driving the feed screws by means of a belt is being rapidly replaced by positively driven feeding devices, either entirely through gearing, as in the machines shown in Figs. 9, 18 and 25, or by a combination of gears and chain, of which Fig. 19 shows a good example. The machine shown in Fig. 18 is a direct development of the first Cincinnati miller, shown in Fig. 17, and is a good example of the " geared feed" machines made by that company. 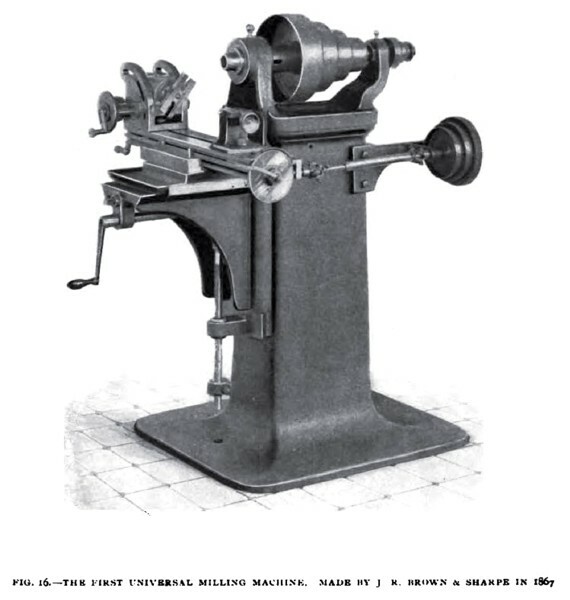 One of these machines was exhibited at the Paris Exposition in 1900, and was the first universal milling machine, which embodied the combination of a positive feed drive and a quick feed changing mechanism. These features were very much commented upon, and not always favourably, because even at that recent date a great many well-known machine tool men feared the consequences that might result from accidents on a miller that did not possess the '1 safety valve of a slipping feed belt. Hardly two years have passed since then, yet so complete has been the reversal of opinion that 1902 is seeing the almost universal adoption of some mechanism designed to form this combination on millers of this type. Faster feeds are being used than were considered practicable several years ago, when a feed of 0.150 inch per revolution of cutter was thought to be excessive. The machine in Fig. 18 provides sixteen changes of feed, ranging from 0.006 inch to 0.300 inch per revolution of cutter, and this particular feed-changing device permits changing the rate of feed through the whole series of changes while the machine is working. 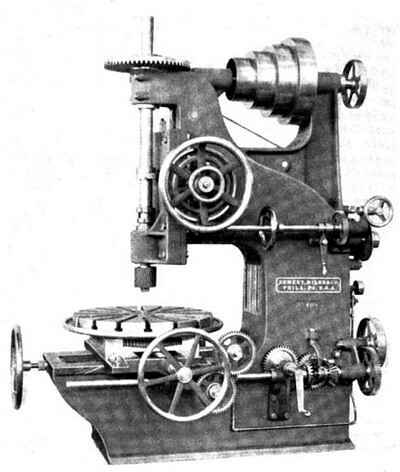 This is accomplished by bringing the different combinations of gears, formed by a fixed cone of gears and a sliding gear, into mesh radially by a simple movement of the levers shown over the feed-box at the rear of the machine, and the rate of feed is at all times indexed by the position of the lower lever. It has power feed for the table in all directions, namely, lengthwise of the table, crosswise in line with the spindle, and vertically, the feed in all directions being under control of a reversing lever. The method of swiveling the table is the same in principle on all universal millers, and provides sufficient angularity to cut spirals up to and including 45 degrees. Fig. 19 shows a machine brought out recently by the Brown & Sharpe Manufacturing Company. This is entirely new in design and embodies some very interesting features. The over-arm is clamped by a single lever attached to one of the clamping bolts. Each of the clamping bolts carries a pinion, and both engage rack teeth cut in a bar, which connects the bolts, so that they are both operated simultaneously. The feeding mechanism is positive in its action, being driven from the main spindle of the machine by 3 chain to a sprocket, which can be clutched to either one of two prime driving gears of different diameters, the clutches being operated by the small lever which can be seen on top of the gear-box. Power is transmitted from either one of these prime drivers to an intermediate shaft carrying two sets of gears, three gears of different diameters in each set, and all keyed to the shaft. These six gears drive a series of six loose gears, all of which run independent of one another, on a shaft that is connected directly to the knuckle joint shaft which transmits motion to the clutches driving the feed screws. These six pairs of gears are always engaged, and the variation of the feeds is obtained by engaging the different members of the series of loose gears with the shaft on which they run. This is accomplished through the medium of a series of six locking pins, carried in a ring keyed to the shaft, and so arranged as to engage the different gears in the series, recesses being provided in the hubs of the gears to receive them. The pins are controlled by a cam, carried by an index disk and arranged in such a manner that there is no possibility of engaging more than one feed at a time. The index disk is figured to correspond to the feed table on the outside of the case, and the change from one rate of feed to another can be made in a very short time. The six pairs of gears described provide as many changes in feed, and this number is doubled by the two prime drivers, making a total of twelve feed changes, ranging from 0.005 in to 0.100 inch per turn of cutter. All feeds are reversed by a lever that can be plainly seen on the case, which contains the reversing mechanism, and is mounted on the side of the knee. The main spindle is driven by a three-speed countershaft which, in connection with the three-stepped driving cone and back gears, provides twelve speeds in " forward '' direction and six reverse, the "forward " speeds ranging from 18 to 366 turns per minute. A universal miller with belt-driven feed, having a lever feed changing device, is illustrated in Fig. 21. This is one of a series of millers made by Kearney & Trecker. The levers, by the simple movement of which any one of twelve changes in feed can be obtained, are clearly shown on the feed-box at the rear of the machine. In Fig. 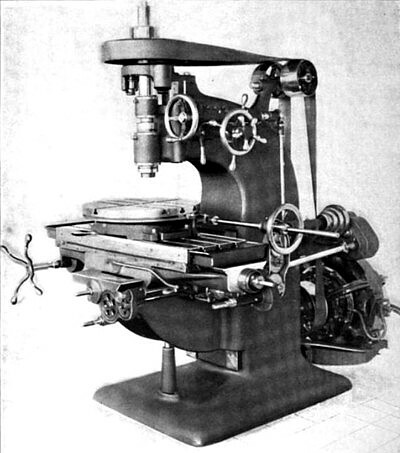 20 is shown a plain miller made by the Becker-Brainard Milling Machine Company. It has a belt-driven feed, changes being secured by the use of stepped cones and change gears. A distinctive feature of this machine is the extreme length of its saddle, which forms a bearing for the table as long as the table itself. Another universal miller with belt-driven feed is shown in Fig. 22. 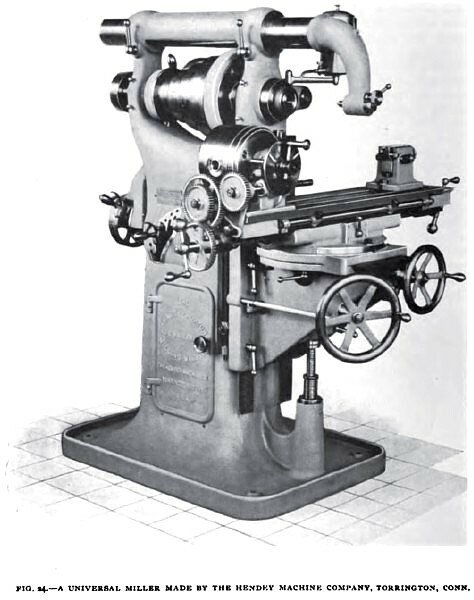 This illustrates the present style of machines made by the Kempsmith Manufacturing Company, which have grown out of the original designs made by Mr. Frank Kempsmith, who was closely identified with the development of the modern universal miller, and to whom belongs the credit of having first recognized the value of, and used, a tie between the tops of the column carrying the spindle bearings in machines having a horizontally adjustable overhanging arm. These machines first appeared about 1890, and within a few years thereafter the top tie was placed on nearly all machines of this type. The spindle of this machine is driven by a four-step cone from a two speed countershaft; being back geared, it has sixteen changes of speed. The feed is driven through a four-speed gear train and a belt running on a four-step cone, giving sixteen changes in the rate of feed, ranging from 0.004 inch to 0.100 inch per turn of spindle. The four changes provided by the gear train are under the control of a lever, and changes can be made without removing any parts, the feed of the table is automatic in all directions, that is, longitudinal, crosswise and vertical. The universal miller shown in Fig. 24 is a newcomer in the field. Which will gain for itself an important place in competition with other makes. It is made by the Hendey Machine Company, and is equipped with the well known Norton feed changing device, providing eighteen changes in the rate of feed, ranging from 0.003 in to 0.160 inch per revolution of cutter. The feeding mechanism is contained in the column of the machine, and is driven from the main spindle by a belt. This machine possesses a telescopic elevating screw, an upturned rim on the base, which forms a catch basin, lever clamps for locking the knee, column and saddle together, and the angular position of the elevating shaft, all of which are common to the other machines of this type. A series of plain millers, which embody the same general design as the universal miller in Fig. 18 are made by the Cincinnati Milling Machine Company, the largest of which is illustrated in Fig. 25. This machine is intended for a heavy class of work, and is shown in operation in Figs. 23, 28 and 30. Each one of the machines illustrated in this article is a good example of the particular type of machine, which it represents. No attempt has been made to show examples of all makes of machines, and in the final selection of the examples shown many good makes were omitted for want of space. 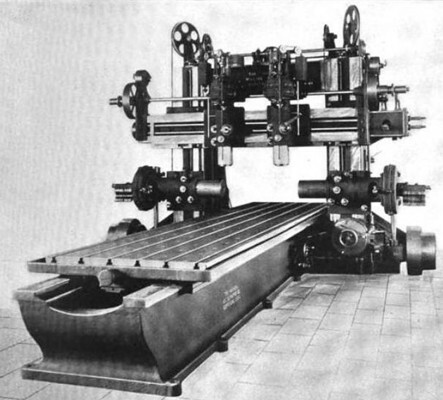 The types illustrated cover the entire field of American milling machine construction, using the term in its restricted sense, exclusive of those machines which are designed for performing a single operation, such as automatic gear cutters, cold saw cutting-oft machines, worm and worm-wheel forming machines, rotary planers, etc., and an idea of the extent to which this one special branch of the machine tool industry has grown can be gained from a consideration of the fact that there are to-day more than thirty different machine tool builders in the United States who make milling machines, and six of this number manufacture millers exclusively. Until quite recently the milling machine was supposed to be adapted to finishing only very small, light work. The extensive use of the large planer type machines, however, has demonstrated the practicability and economy of milling the heaviest pieces. 2. —Inadequate rigidity of machine. 3. —Timidity due to lack of experience on the part of both builders and operators. The most common defect in cutters is the lack of sufficient space for chips between the cutting edges. Early milling cutters had very small teeth, resembling somewhat the teeth of a file, and their action, as compared with the action of a modern milling cutter, was more of a grinding than a cutting process. But with the development of the milling machine came improved cutters, and as the machines were made stronger and more rigid cutters of larger size, having larger teeth with wide spaces between them, were introduced. Good examples of modern cutters are shown in the illustrations of milling operations, — Figs. 23, 26, 27, 30, and 31. 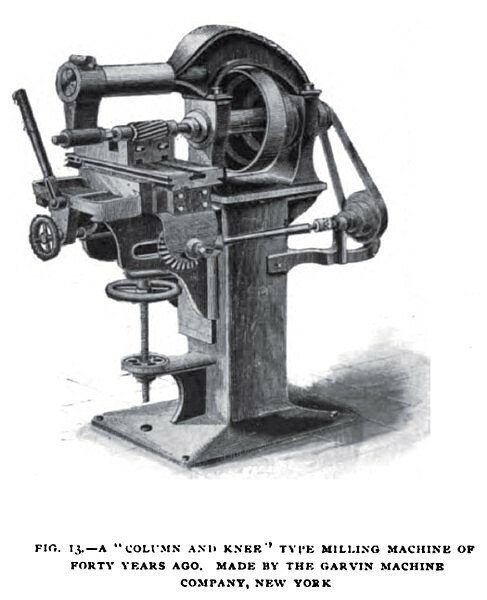 The little illustration on the opening page of this article shows a heavy cutter with spiral, nicked teeth, and represents a style of cutter that is very efficient for taking roughing cuts. It is 4 inches in diameter, has twenty teeth, 1 1-16inch pitch, which leaves ample space between the teeth for chips. The nicks in the cutting edges of the teeth give the cutter a free cutting action and reduce the tendency to chatter to a minimum, producing short chips, of which the cutter easily clears itself. When a cutter with closely spaced teeth is used for taking a heavy cut, the spaces between the teeth become clogged with chips and the cutting edges are dulled as much by being obliged to recut these chips as by actually removing metal from the surface being milled. These difficulties were obviated to a great degree by the invention of the Ingersoll milling cutter (see Fig. 23), which consists of a cast-iron cylinder into which are drilled a series of radial holes, laid out in the form of a spiral. Into these pieces of tool steel are driven, and their projecting ends form the blades or teeth. It is plain that such a cutter will clear itself of chips, and it is considered good practice to rough off cast iron with a feed of from 6 to 10 inches per minute with an Ingersoll mill 4½ inches in diameter. In performing the operation shown in Fig. 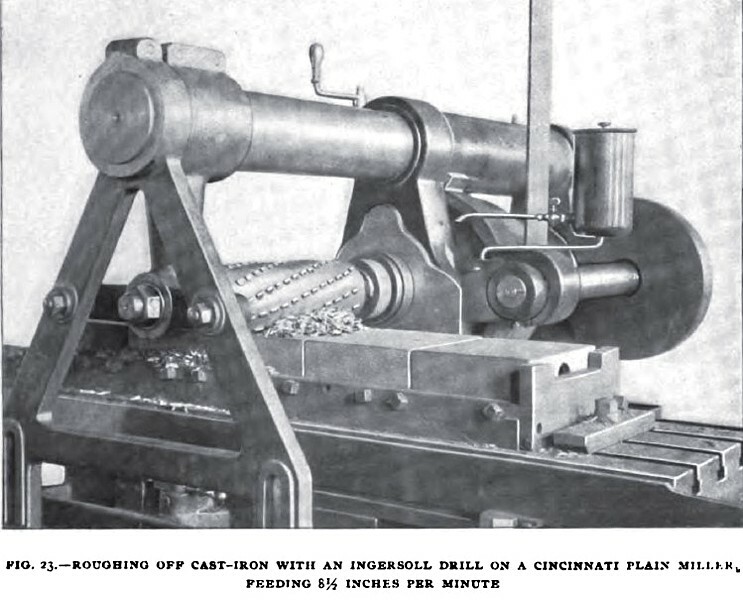 23, the machine was feeding 8½ inches per minute, taking a roughing cut 1/8 inch deep and 8¼ inches wide in cast iron, with an Ingersoll mill, 4½ inches in diameter, working at a surface speed of 40 feet per minute. Fig. 28 shows the same machine finishing irregular surfaces to gauge by using cutters in gangs. The material is cast iron, and the piece is held in a jig and finished in two operations, using two sets of cutters. The first operation consists of a roughing cut, and when it is complete, the arbour carrying the roughing cutters is replaced by an arbour carrying a set of finishing cutters The piece is very frail, and for that reason is difficult to mill, making two cuts necessary, and even then the machine must be fed very slowly. The cutters are 3x6 inches in diameter, and the roughing cut is taken with a feed of 0.052 inch per revolution of cutter, the cutters making 26 revolutions per minute, while for the finishing cut the rate of feed remains the same and the speed of the cutters is increased to 40 revolutions per minute. This job is being done in the manner described in just one-half the time required to do it on a planer when using the same jig, and is finished with a greater degree of accuracy. Fig. 26 shows a four-spindle Ingersoll miller finishing two sides of an iron casting at one operation. The cutters are worked at a surface speed of 35 feet per minute, and the table travels at an average of 3 inches per minute, requiring less than one-half the time required to do the same work on a planer. It is, of course, evident that this machine can finish three sides of the casting at one time if desired. Figs. 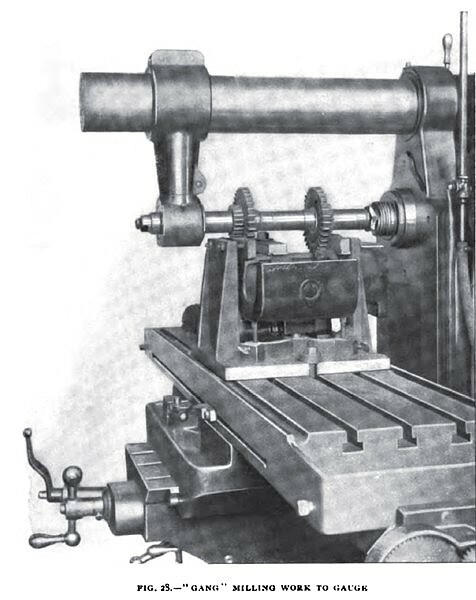 27 and 31 show a Becker vertical-spindle miller in operation, the first being an example of face milling, with an economy over the planer of three to one, and the second, milling spots on an inside surface with an end mill, giving an economy over the planer of three to one, and the second, milling spots on the inside surface with an end mill, giving an economy over counterboring of ten to one. Both of these are examples of work that would be difficult to hold for face milling with a cutter in a horizontal spindle. Fig. 29 illustrates the operation of cutting a number of spiral gears at one time on a Milwaukee universal miller. The gears are held on a mandrel, which is supported at its outer end by an adjustable cylindrical bearing instead of the usual pivot bearing of the tail stock centre. The arrangement shown is only temporary, being classed as a special fixture for that particular job; but the advantage of a cylindrical bearing in this place, when milling heavy work, is so obvious as to make it surprising that it is not generally used. The cost of the gang of cutters used on this work was approximately $50,— certainly a very small outlay when compared with the saving effected. 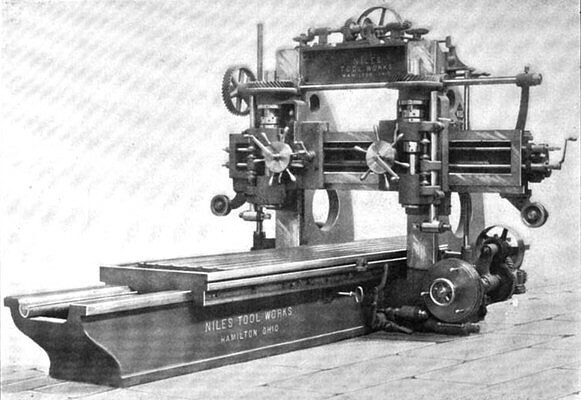 The miller was handled by a 12½-cent boy, while “the planer was in charge of an expert planer hand, put on his metal to do the work in the shortest possible time," which shows an additional advantage in favour of the miller in this particular case, although it is question able whether it is not better in the long run to put a competent, intelligent man in charge of a miller, for the same reason that one would put such a man in charge of a planer to do the same work. The question is often asked, " What rule is there for determining the proper speed of cutters and the best rate of feed?" And when a direct answer is not forthcoming the questioner is at once disappointed, if not discouraged. As a matter of fact, no " hard-and-fast" rule can be given. The surface speed of the cutters for each job must be determined by the hardness of the metal operated upon. Forty feet per minute may be taken as a good basis for cast iron when taking a heavy roughing cut. For a light finishing cut, after the scale has been removed, 50 feet per minute is none too fast on ordinary machinery castings. In the same way 20 feet and 60 feet per minute are good base figures for determining the correct cutter speed when working tool steel and brass, respectively. Aside from the hardness of the material, the nature of the cut is also an important factor in determining cutter speeds. For instance, a slitting saw can be run about twice as fast as a large surface mill working on the same material with regard to the rate of feed, the most advanced practice is to take a roughing cut with the fastest feed the machine will pull, providing the cutter used is strong in comparison with the machine, and even if the nature of the work requires a cutter of such a form as to be comparatively weak, it is considered better economy to break an occasional cutter than to allow the machines to work at a slow rate of feed. When crowding a machine on cast-iron work, a jet of air, delivered to the cutter with sufficient force to clear away the chips as fast as they are made, permits the use of much faster feeds and prolongs the life of the cutter. A stream of oil has the same effect when working steel, and too great stress cannot be laid on the importance of delivering the oil under pressure, so as to wash the cutter entirely clear of chips. The danger of burning the cutters lies in too fast a speed, not in too fast a feed, and when both speed and feed are [up to the highest safe limit the actual rate of table travel per minute can often be still farther increased by reducing the speed of the cutter and increasing the rate of feed. When taking a finishing cut the rate of feed must be determined entirely by the quality of finish wanted. A feed of 0.030 inch per turn of a ¾-inch diameter cutter when surface milling leaves a good finish, requiring very little scraping to give an excellent bearing surface for machine tool work. One of the most important factors upon which successful milling depends, and one that is so often overlooked, is that of properly sharpened cutters; consequently, a good cutter grinder is an indispensable adjunct to the milling machine. The examples of milling operations given in this article have been selected not because they necessarily represent the best attainable results in milling, but rather to give an idea of what is current practice in milling work of widely varying character.